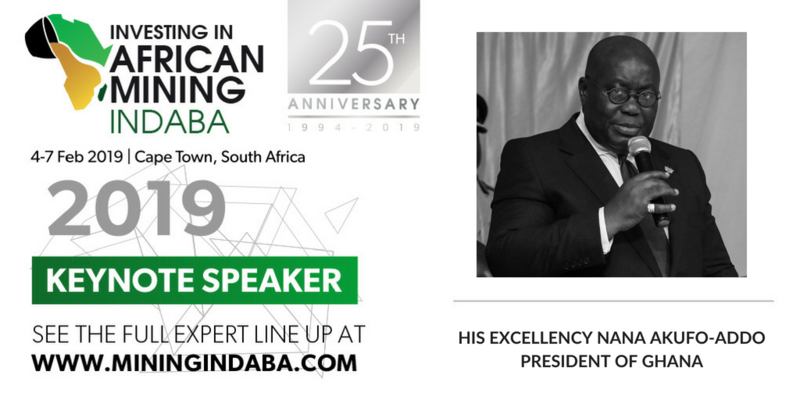 His Excellency Nana Akufo-Addo, the President of Ghana, will speak at the 2019 Investing in African Mining Indaba, which will be taking over the Cape Town International Convention Centre from 4-7 February for its biggest event yet – its 25th anniversary celebration! As one of the major mining centres on the African continent, this presents delegates with an excellent opportunity to hear about the future of Mining in Ghana and the firm intention of H.E. President Akufo-Addo to ensure that the government is fully committed to promoting the expansion of local and international value chains that would benefit small producers and entrepreneurs from Ghana and the rest of the African continent. In 2018 a fresh revamp of branding and direction brought the focus back to Mining Indaba’s role as a deal-making forum, with a 15% increase in overall attendance and 47% more mining executives. New elements of the event such as the Junior Mining Showcase and re-developed Sustainable Development day created platforms designed to explore unique aspects of the mining industry, which was well-received by attending delegates. Renewed positivity around commodity prices and the mining industry also added to an atmosphere of excitement at the event, which went on to win ‘Best large scale event’ at the 2018 Conference Awards this summer. The 25th anniversary in 2019 will build on the hype of last year’s success and is expected to feature a host of exciting initiatives to celebrate 25 years of progress in African mining.